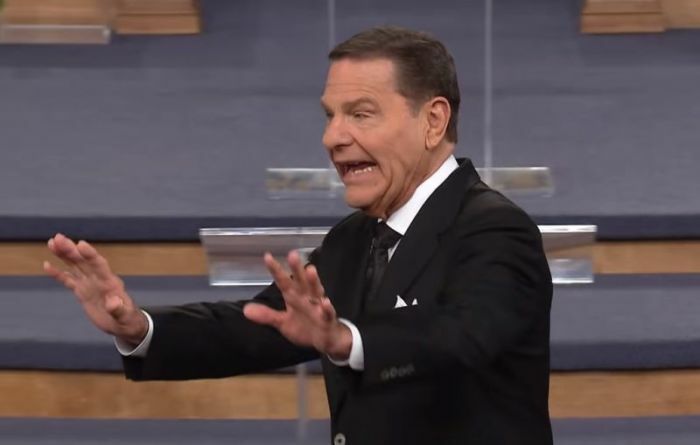 Televangelist Kenneth Copeland says God once told him to lay hands on a corroded private jet and that He would heal the plane when he did. In a message delivered last week titled "Faith for Healing Comes by Hearing," the Texas-based minister, who aligned with the Word of Faith movement, recounted that a member of his board had an older plane that had been parked for a few years and that a team of people did several X-rays on the fuselage and other spots on the aircraft and found some corrosion. "I was praying over it," Copeland said. "And just as plain, the Lord said to me: 'Lay hands on it. I'll heal it.'" "He said: Kenneth ... corrosion comes from the curse. He said, 'I provided an airplane for you, didn't I?' I said: Yes, sir. He said: 'Lay hands on it.'" He started praying and began putting his hands on the body the aircraft. "I laid hands on it all over and it's a big ol' airplane and it took a while to do," he said, commanding the corrosion to leave in the name of Jesus. X-rays were subsequently performed on the aircraft after his prayers and only one small spot of corrosion remained, he said. When Copeland prayed about that small corroded spot, he said, the Lord then said to him: "I wanted to remind you" that objectors "could have said maybe the X-rays were [faulty]." Copeland said he laid hands on it and prayed again, and the spot disappeared. As evidence of what he said God did, Copeland read Jeremiah 33:6, which says: "Behold, I will bring [the city] health and cure, and I will cure you, and will reveal unto you the abundance of peace and truth." Copeland also read aloud "I will bind up that which was broken, and will strengthen that which was sick," which is Ezekiel 34:16, and "Behold, I will cause breath to enter into you and you shall live. And I shall put my spirit in you and you shall live" which is found in Ezekiel 37: 5 and 14. He's previously described flying in commercial airliners as being like "getting in a long tube with a bunch of demons." On his ministry's blog in January, Copeland thanked his supporters for helping him purchase Tyler Perry's Gulfstream V jet, petitioning them for even more donations and asking if they had named their "seed" to cover an additional $2.5 million in upgrades to the aircraft. The subject of prosperity evangelists and their private jets rankles many believers in Jesus, particularly the notion that God told them they were to have such a plane while asking for contributions from their congregations and television viewers. Earlier this year, Louisiana-based evangelist Jesse Duplantis made national headlines when he sought donations to help him purchase a $54 million Falcon 7X private jet. When backlash ensued, Duplantis maintained that God challenged him to "believe" Him for it and that the mass media had twisted the story. "First things first, I never raised money for the plane," he said. "I put it in our magazine and said, 'Believe in God with me.' There is a vast difference between 'Believe in God' and asking for money." Duplantis added that God also told him: "You don't need to raise money for this. This will just come." Among those criticizing Duplantis was gospel artist Kirk Franklin who wrote in an Instagram post that "[m]any of these 'ministries' built their wealth on the backs of poor rural minorities that put their trust in the hands of 'god's shepherds' only to see the prosperity benefit those doing the preaching."